Capitalism Unbound: The Incontestable Moral Case for Individual Rights is a concise explanation of capitalism’s moral and economic superiority to all forms of socialism, including America’s current mixed-economy welfare state. Bernstein shows that the current crisis is essentially similar to the Great Depression in its causation and in the steps necessary to resolve it. The book’s concluding section applies moral and economic principles to the current economic crisis, showing that government intervention is its cause and a policy of laissez-faire its necessary solution. Furthermore, socialist/statist policies are universally the cause of social calamities and that the answer lies in individual rights and laissez-faire capitalism. The principles that this book clearly articulates are timeless; in diverse forms, the conflicts these principles explain will recur repeatedly throughout history. As a result, this book is relevant not merely today, but will be forever. Bernstein accomplishes all of this in a concise, lively, impassioned volume that is fully accessible to potentially countless readers. 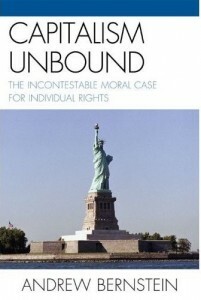 Order Capitalism Unbound: The Incontestable Moral Case for Individual Rights online from Amazon.